What makes a home luxury? There are plenty of luxury home upgrades that can make your home feel more up to date and sophisticated. Why Have Luxury Home Upgrades? It’s always a good idea to make your home feel luxurious, so that you feel comfortable and want to spend your time there. As well as this, some luxury upgrades, although they’re not large-scale projects, can significantly increase the value of your property. So, the better and more luxurious your property is, the more sought after it is and the quicker it will sell. Luxury upgrades in your property can make it an easier and more enjoyable place to live, so it’s worth saving up some money to either extend your home or upgrade something within your property. Want to know how you can make your home more luxury? We’ve devised a list of the best and most effective home upgrades to help you when deciding on what you should do with your property, so keep reading! Not only can having a spare bedroom make your home more appealing but it also adds convenience for not just you, but also future homeowners. It can add anywhere between 5-10% on top of your homes original value, but can differ depending on whether your spare bedroom has something like an en-suite. A lot of homeowners love the thought of having a spare bedroom as it gives them a room that allows them free reign on decoration with no holding back as it’s not going to be theirs to stay in. If the property you’re currently in does not currently have a spare bedroom but you want to add one then not to worry. Our builders Newport Pagnell can assist you in planning on adding a home extension onto your existing property in order to make room for another bedroom. In the summer, a nice patio can be a fantastic location for a garden party. With a barbecue, tables and chairs, as well as picnic tables and ice boxes you can host the perfect summer party. A patio can add up to 3% onto your homes value; it can be more dependant on the size of your patio. It becomes the perfect platform for garden parties, family get togethers, barbecues and gives you the perfect excuse to splash out and add new garden furniture. Need some inspiration? Check out this article with the best garden furniture of 2018. As well as this, adding a patio or replacing your old one is one of the most inexpensive forms of upgrading your home, costing around £2000 on average. If this is out of your budget then not to worry, choose double doors instead to increase the amount of light let into your home and to give the impression of a more open planned property. Security systems have evolved along with the advance in technology; you can now purchase security systems that show you who is at your front door when the doorbell rings. Meaning that you can save money on CCTV systems by having a 2 in 1 fitted with your doorbell. With things like smart garage doors and smart lights, it is easy as well as affordable to make your home secure, as well as modernised. If you’re on a budget yet want the luxury aspect of security on your property, then don’t worry about automated garage doors and prioritise the smart security systems linked with a doorbell. These can be fitted and purchased for an affordable price, make sure you use a qualified electrician to ensure that the job is done properly. Water features add a sense of outdoor class and can spruce up your garden during the summer months; they also look amazing as centrepieces at garden parties and family events. Water features can be expensive in some cases, but if it’s simplicity you’re after, then it’s more than easy to find a cost-effective and straightforward water feature. None of the water used in the feature goes to waste, and they also aren’t that costly to run and maintain. We love all of the water features from WaterFeautures2Go ranging from low price yet high-quality water fountains all the way up to more costly bigger water features. Get ready in peace and style when designing your own personalised dressing room. It can be a pain having to get ready in your bedroom and often causes a lot of mess and confusion, so why not use the spare space in your home to create your dream dressing room? You may already have the correct accessories, a dressing table, wardrobes, drawers etc. So it can be easy enough to do, especially when you already have the space in your property. With modern day designs, it can be easy to create an up to date fashionable aroma in your dressing room. Things like light up casements work great at accentuating your favourite outfit, shoes or bag or can even be the centrepiece for your aftershaves and toiletries. Experiment with your dressing room and let your imagination flow. Colours schemes of neutrals, greys or white can help bring the modernised flare you are looking for, or why not add wallpaper featured wall to spruce up your design? Underfloor heating has quickly risen in popularity over the past few years. It’s so popular as it makes getting out of your warm bed and walking on the newly heated kitchen floor for a cup of coffee slightly more bearable before work. In kitchens, especially modern ones, it’s common to have large tiles that are ceramic. Due to their materials, they are not insulting in any way whatsoever. Heating your home overnight is costly and unnecessary when you are curled up in a warm bed. Meaning that your home isn’t going to have much heat to retain overnight, and your cold kitchen and bathroom tiles are definitely not going to be collecting and preserving heat. Underfloor heating means that no matter the weather, your floors are going to be heated and comfortable to walk on. Your feet are responsible for your overall body temperature, which is why when you have cold feet you often feel cold all over. Walking on floors that have underfloor heating can help keep you warm in the early mornings, and eliminates the shock of jumping out of a pleasant warm shower to freezing bathroom tiles. Loft conversions are one of the upcoming trends in home improvements that homeowners are going crazy for. The best thing about loft conversions is they require no editing to the rest of your home, and simply utilise the space in your home that is already there. Not only this, but they’re one of the most cost-effective forms of home improvement offered by us and can completely transform the look of your home. As a luxury home upgrade, loft conversions are ideal for those who are looking to modernise their home and bring it more up to date. If you have a timely home, loft conversions can be fantastic; often large, timely homes provide a tremendous amount of loft space that can be transformed into sometimes multiple bedrooms. Most loft conversions can take from a month to slightly longer, making them one of the simplest and most convenient forms of home improvement. Loft conversions allow homeowners that are looking to expand their family, or create another recreational room in their home, without having to move out of their current neighbourhood to a property that offers more living space. Loft conversions are often used for recreational purposes and transformed into luxury rooms that you would not find in a typical household. For example, games rooms, cinema rooms, dens, gyms and even offices. So if you’re looking to plan your dream conversion and put it into play, be sure to contact us today about our project management services Olney. Another form of popular home renovation is to install a wet room. Wet rooms make the central part of your bathroom one big space, without the need for shower enclosures. With a wet room, in the centre of the floor is a plug hole that is built into the floor, rather than attached as part of a shower unit. The floor usually is slightly dipped to allow water time to flow down the plughole without flooding the entire bathroom. Wet rooms are fantastic for those who enjoy a good pamper; there are so many different design options that allow you to add personalised touches and make your showering experience more comfortable. You can purchase benches that will enable you to sit in the shower for ultimate relaxation. Wet rooms often come with functional flooring that optimises safety and will prevent you from slipping or falling, which means that you won’t have to purchase shower mats that can ruin the design and visual of your bathroom. If you’re wanting somewhere to relax undisturbed in the evenings with a gorgeous view of your garden, a conservatory could be the perfect addition to your home. Conservatories have a variety of different designs, sizes and shapes in order to coincide with the appearance and size of your home. Most conservatories are used as a recreational room or as an escape for a slight bit of peace and quiet; they also create the perfect atmosphere for afternoon tea! Conservatories are a home extension so will likely have to take up some of the space in your garden, but they’re worth it! They’re a fantastic addition to your home and can add the touch of luxury that you’re looking for. Make Your Home Lavish And Luxury Today! There are plenty of cost-effective ways that can improve the look and efficiency of your home. 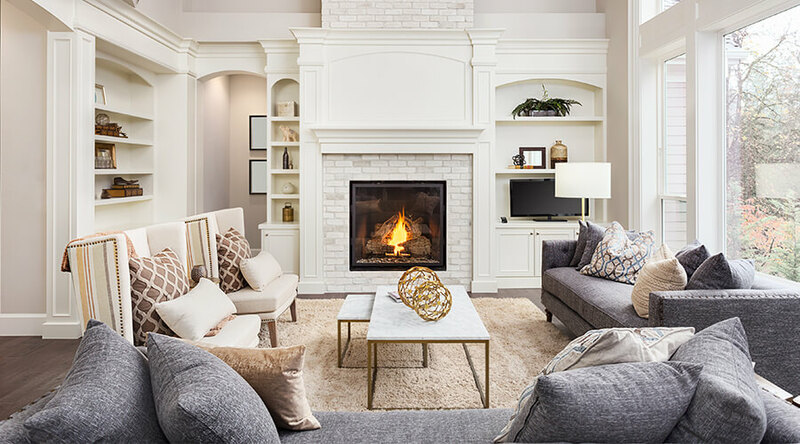 By upgrading your home with these luxury features not only does it mean that it’s a more enjoyable place to live, but it also means that you can sell your property for more money and that your home will be more sought after and sell quicker. Want to upgrade your home but aren’t sure how? No worries! Our dedicated building team have the experience and knowledge to help you plan out and build your dream home extensions Towcester. Contact us today about new build houses Buckingham We hope that this article was helpful, if it was then why not share this article on social media?